It is believed that turmeric has been used for centuries. It has many known benefits, but one of its many useful properties is that it can help treat several skin problems in order to achieve healthy, glowing skin. Turmeric can be used to treat acne due to its antibacterial properties. It also contains Vitamin E, which is essential when it comes to revitalizing and moisturize the skin. With these benefits, using turmeric regularly can eventually help restore the skin to its youthful glow. That being said, let’s find out what the best turmeric soaps are in the market today. Below is a list of options you can buy to achieve that healthy and glowing skin you’ve always wanted. This turmeric soap from Aspen Kay is loaded with turmeric. The company also uses natural and organic ingredients to make this beautifying and cleansing soap. 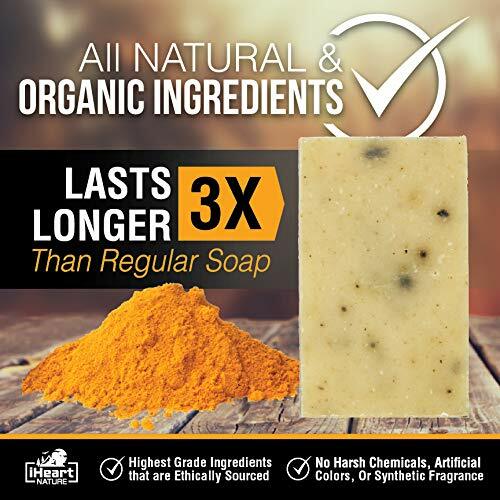 This soap contains ingredients that your skin will truly love such as sunflower oil, turmeric root, extra virgin olive oil, unrefined shea butter, and others. Click here to read Amazon reviews of this soap that mention “acne”. This would make a useful addition to your organic skincare routine no matter what your skin type is, including those with extra sensitive skin. It’s a very versatile soap too — it can be used on your body and face, and this works as a shaving soap for men too. It is so gentle, even babies can also use this. For animal lovers out there, you’ll be happy to know that this soap had not been tested on animals. It is also made by hand in small batches to ensure you of the quality of the product. Should you encounter problems with this soap or find yourself unsatisfied, the company will have no problems refunding your money without questions. 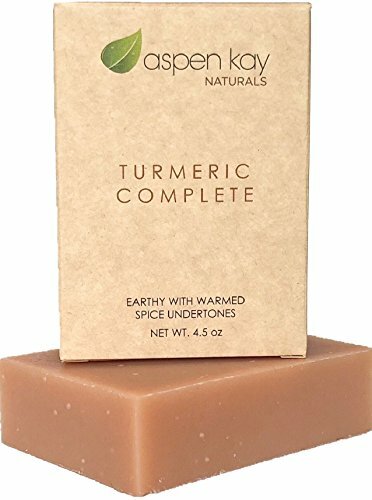 Unlike other products that only have turmeric root powder, this organic soap from Aspen Kay Naturals also has turmeric root extract as well as 100% pure turmeric root essential oil. This cleansing soap has all the good benefits of both turmeric and neem. It also smells so good while at the same time providing you with that deep but gentle cleansing. 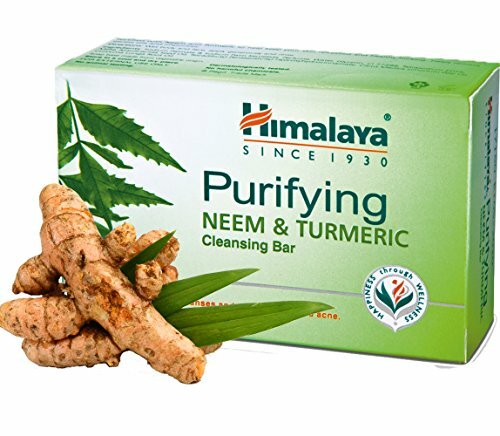 The Himalaya Purifying Neem and Turmeric Cleansing Bar can be used as a beauty bar, but it is also safe for use for the whole family. This specific item is packed into 6, so it would also make a perfect gift for family and friends. You also get to save money in the process. Apart from turmeric and neem, this soap also contains essential oils and herbs. Turmeric cools and soothes the skin, leaving you feeling fresh and rejuvenated. Those with stubborn acne can benefit from using this cleansing bar as well since it facilitates deep cleaning. The main negative point about this soap is that it contains a strong fragrance with perfume listed as an ingredient. Tumeric does have a strong smell that many people find unpleasant so it’s not uncommon for brands to add some kind of fragrance but some buyers find the smell of this one too overpowering. Himalaya is a brand that’s been trusted since 1930, guaranteeing you that the Himalaya Purifying Neem and Turmeric Cleansing Bar will help you achieve the skin that you’ve always wanted. This soap bar weighs in at 6 oz and last three times longer than your average soap. The premium ingredients this soap has makes it great for use for both men and women, including olive oil and cocoa butter. By now, you already know that turmeric has the power to lighten, whiten, and brighten your skin. This is why it is effective if you want to achieve that glowing effect on the skin. Turmeric is used extensively in Ayurveda Healing Arts in order to combat scarring, reduce pores, erase dark spots, and prevent acne. This particular turmeric soap from iHeart Nature can be used in the face, body, and as a hand soap. It is loaded with turmeric herbal powder — both turmeric essential oil and turmeric root powder. Another thing. The clove buds also make sure that your skin is exfoliated. This turmeric soap is best for all skin types, whether oil, dry, and even sensitive skin. 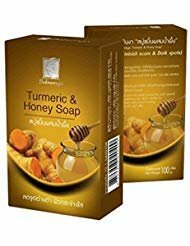 This turmeric and honey herbal soap is trusted by spa owners as it helps cleanse the body and face without drying the skin. The turmeric content of this soap and beauty bar helps to erase dark spots and scars, and it can also cure rash and irritation. Meanwhile, has antimicrobial properties and antioxidants that refresh and rejuvenate tired and dry looking skin, leaving it silky and soft. It’s made of natural ingredients and can be used for a long time. When shopping for turmeric soaps, always read the ingredients list and avoid products that contain mercury. Choose brands that only have safe and effective ingredients in addition to turmeric, like papaya, glutathione, and kojic acid. And before buying a lot of one specific product, perform a skin test first to check if it doesn’t irritate your skin. Above all, keep an open mind. If a product doesn’t work for you, it doesn’t mean it’s not effective for everybody else. You may have to go through a number of beauty soaps to find the one that really works for you. Check our post on the Top 10 Ayurvedic Soap Ingredients, too! We also posted about the Best Neem Soaps, Best Oatmeal Soaps, Best Sandalwood Soaps, and Best Almond Soaps.